Home » #ThanksStevie » Anfield » LFC » LIVERPOOL FC » Liverpool Football club » Melwood » Nigerian Liverpool Fans » Sports » Steven Gerrard » StevieG » The Kop » YNWA » Steven George Gerrard; The End of A Football Era! What I was beginning to glimpse with my crushing eyes, was made glaring to the footie world during the #UCL of 04/05. A game against Olympiakos. LFC went far in that Champion league campaign due to the tactical genius of a certain Rafa Benitez, no doubt. However, on the pitch, it was one man's hope as he martialled the troops, strutting like a general; filled with determination that caught your eye. If there were any doubting Thomases, May 25th 2005 shut them all up.At half time, Liverpool was 3 goals down to a team with Schevchenko, Gattusso, Nesta, Pirlo and Kaka in it. Stevie scored the first for LFC and the way he celebrated was to wave his arms, urging his teammates to "come on". Passion at its peak. Before that game went into penalties, #CaptainFantastic was playing in RB. The next year 2006, the FA Cup was re-christened the #GerrardCup. Who else? Many people have opined that Paul Scholes and Giggs were better players than Gerrard. I find it quite insulting, no offense. If Scholes had played with David Ngog, Insua, Dossena, Josemi, Nunez, Voronin, to mention few, then yeah; it'd be a fair comparison. Since Gerrard was the one to carry his team on his back through most of his later career, he's above and beyond the others in my book. The stats have never been a complete description of a player and they will truly never do Stevie justice. 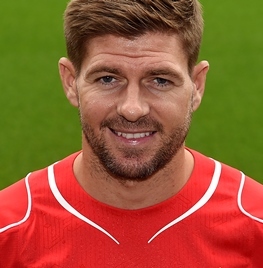 Like +Empire of The Kop tweeted, "In 50 years' time us fans will be telling stories about Steven Gerrard. They still won't understand how good he was." Truly, they won't know the feeling of how your hairs curled up at your nape just as he scored an incredible belter in a Merseyside derby. Am glad that a part of the current crop of players had him to learn from. About the famous slip against Chelsea, I said then and I say now; “I forgive him”. There's nothing to forgive even. Legends make legendary mistakes, like they make successes. Thank you, the skinny boy in the white towel in a picture with his seniors who went on to be the leader of the pack. Thank you for the beautiful memories that are a part of my treasure trove. As this chapter of your football journey closes, I await with anticipation the next one and hope; no, pray, it brings you back to the club you love. The club I love. Our Liverpool Football Club. #YNWA StevieG, the best no 8 there ever was!! !